This month's daring bakers challenge was quite interesting and I really enjoyed making it as well as eating because its our favorite one " Cream Puff ". But the real challenge is arranging them to a "Piece Montee" which means "Mounted piece". This is also called as "Croquemboche" means "crunch in mouth" . It is a high cone of profiteroles (choux filled with pastry cream) sometimes dipped in chocolate bound with caramel, and usually decorated with threads of caramel, sugared almonds, chocolate, flowers, or ribbons. It is a traditional wedding cake in France and also served in baptisms, and first communions. I filled my puff (half batch) with my favorite Vanilla Crème Patisserie and other (half batch) with my husband's favorite coffee pastry cream. Offcourse my son loves both. Since I had so much strawberries I thought of arranging the croquemboche with berries which will be apt for spring too. Caramel acted as glue for my Piece Montee. Hope you all will enjoy my Piece Montee. Thanks cat for this wonderful challenge. Blog-checking lines: The May 2010 Daring Bakers’ challenge was hosted by Cat of Little Miss Cupcake. Cat challenged everyone to make a piece montée, or croquembouche, based on recipes from Peter Kump’s Baking School in Manhattan and Nick Malgieri. You will want to use your puff pastry batter and chocolate glaze or caramel as soon as it has been prepared and as close to serving time as possible. This is not a dessert that stores well and it may be a bit temperamental in humid areas as the glaze needs to harden to hold the choux together. The crème patisserie can be made a couple of days in advance and stored in the fridge until ready to use. You will need approximately 10 minutes to prepare the puff pastry, 10 minutes to pipe and about 30 minutes to bake each batch. The crème patisserie should take about 10 minutes to cook and then will need to be cooled for at least 6 hours or overnight. The glazes take about 10 minutes to prepare. Pavithra, I do not have any words for this. It is simply mind-blowing, what a recipe and what a presentation. Simply amazing, wonderful and many such adjectives are nothing. Simply beautiful !!! Awesome they look..... so pretty too!! Thats really a lot of work! Hats off to you Pavi,looks so great! Nice post! looks wonderful. Great looking dish. This is so beautifully done! I just love how you mounted your puffs. Bravo! Beautiful! Love the straberries :) very nicely done. wow you have done it really beautifully pavithra...well arranged;.looks awesome..worth your efforts.. I've been admiring this ever since you posted it on the DB forum. Def one of the prettiest ones I seen and yum yum to strawberries! My first words were wow. That's impressive and very beautiful! What a fantastic job... Grgeous presentation. Superb. Keep up the good work. Fabulous work, u done a great job Pavi..ur piece montee looks truly tremendous and simply awesome..
Gorgeous! Love the strawberries too! Pavi, I so much adore you for your patience da.. only the name is common I wish I have had atleast one percent of your patience .. kudos da..
Just brilliant ... Hats off da.. 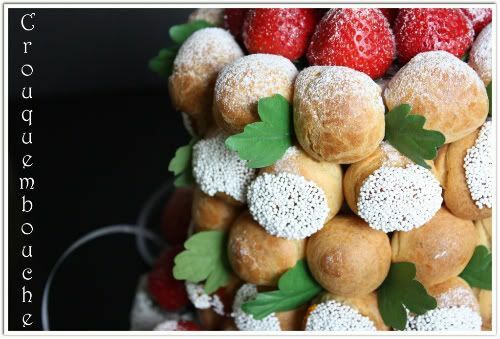 Your croquembouche is absolutely gorgeous! I also love your blog. 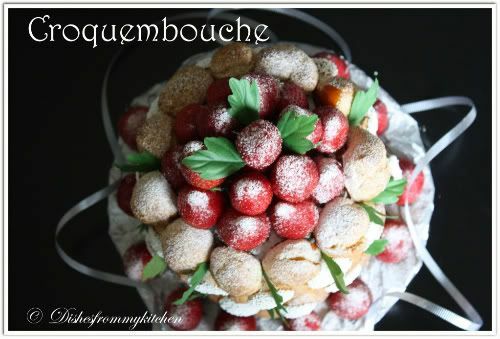 I put in a link to you croquembouche in my post because I loved it so much. I hope you don't mind. 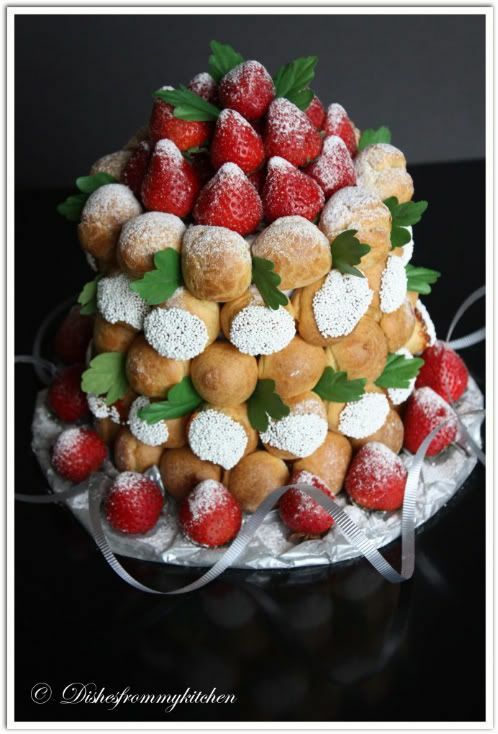 This croquembouche is so gorgeous and elegant! I love the addition of strawberries which is one of my favorite fruit! Great job on the challenge!!!! Kudos to you! Wow....Pavithra this looks awesome and gorgeous. Fabulous work. Nice click too. Yummy dessert! One bite please!!! Just love the way it's presented. fabulous job! Bon appétit! I saw the pic in the forumn and thought it was really beautiful. 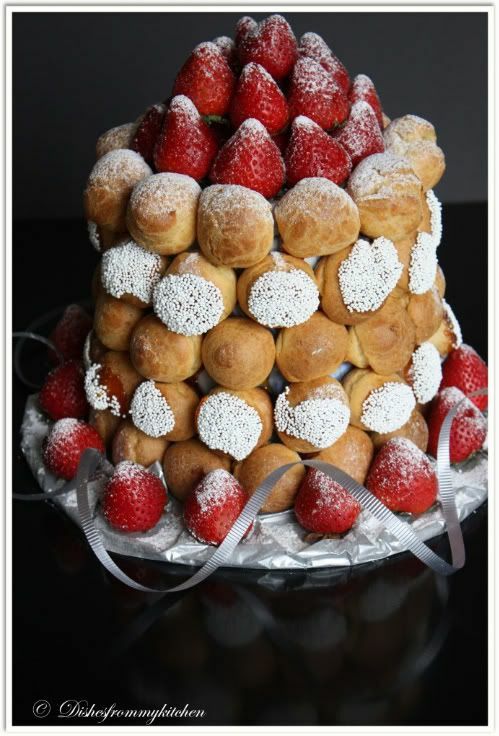 Your croquembouche is absolutely gorgeous! I love how you added color (strawberries) to the croquembouche without making it look clowny.. good job! Great work! Your croquembouche is simply stunning. It's absolutely gorgeous! I love the strawberries. Spectacular masterpiece.This looks just superb. How beautiful. And how diplomatic of your son to enjoy both flavors. :) Seriously, though, the patience it must have taken to construct your finished piece is impressive - it looks so stunning and delicious all at the same time. Wonderful job. Pavithra..no words to say dear..looks absolutely gorgeous..Amazing.. Your croquembouche is simply beautiful! Every time I look at it I'm blown away. What a great job!! Your croquembouche is splendid! You did a great job! Pavi send me some soooooooooooon good, wonderful nd so goes on...!!! Pavithra am speechless. its so neat and gorgeous. dont feel like having a piece and eat it. awesome work. This is one of the most beautiful pieces I have ever seen. 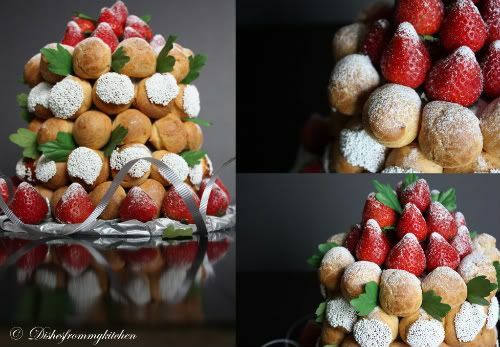 I am not sure I would have felt right being the first to take a puff, or strawberry, from the finished croquembouche, it is such a work of art! Thank you so much for sharing your work and your artistry with us!!. Croquembouche looks really beautiful and delcious with coffee and vanilla cream. 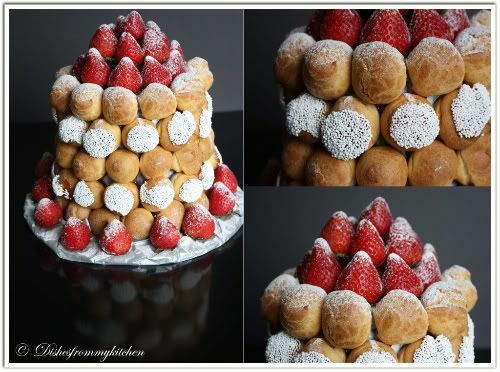 This croquembouche is so phenomenal pavi,wish i was there to finish everything :) Splendid presentation that exposes your artistic talents as well as patience.Kudos to u dear.That's why adhavan likes both the flavors since they would been very delicious. Wow what an amzing recipe and presetation dear. Nice to know abt you more in guest post at Deepa's blog. Congarts on so many awards and keep on rocking. Gorgeous piece, very nicely done!! I think I officially love you now. That's a gorgeous creation...wow!! Well done on the challenge Pavithra! Wow.. beautiful presentation...looks like u have given lot of effort n time...the interest u have shown is Worth it!!! What a nice Croquemboche, great presentation! These pictures are beautiful Pavithra you should be very proud of yourself. I love how you can make sweet food look amazing yet make healthy vegetables look just as amazing too, you really are talented. That looks fantastic! You have done a really great job! Now that is a very very very beautiful take on the challenge! WAY to go gurl! This is such a stunning tower of cream puffs! 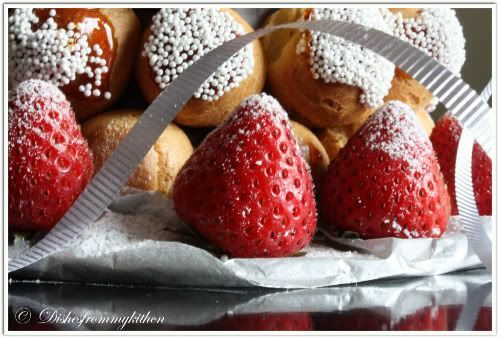 I like the integration of plump ripe strawberries, and how you glazed a couple of the cream puffs. What an accomplishment! Terrific job! Very pretty! I love the way you dipped the pastry in sprinklers. Strawberries looks so goo too, great job. Nicely done - it looks beautiful and tasty. I am stunned!!! !You have captured it soooo well..Amazing!!! You have done a splendid job, Pavi:-) Hats off! wow one of the best DB challenges I've seen so far. Vanilla and coffee and strawberries - yum! Fantabulous !!!! very very pretty :-) guess you enjoyed the challenge.. AWESOME!!!!!! I have no words to describe how beautiful your Pièce montée is. Bravo!!!! Wow! I love your croquembouche, it looks perfect. the strawberries and green leaves are a delightful touch! Did you have some structure inside holding it all together? Such an impressive croquembouche! Love the way you've decorated it. Awesome girl! You did a fantastic job! Really a great and tempting recipe! oh wow, looks so yummy and tempting! i am drooling right over my pc seeing your awesome pics. wow!! That's such a lovely presentation. You are a truly Daring Baker..such wonderful presentation!! Wow.... Wat a gorgeous work..... Looks so good. Lot of hard work done by you. Excellent presentation & Unique Dish. Stunning presentation! Wonderful piece montee, well done. you are amazing... I love all of your recipes!